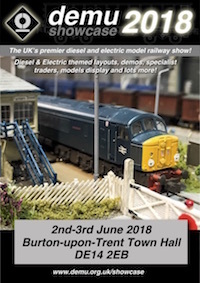 DEMU Showcase is the premier UK exhibition dedicated to diesel and electric modelling and will be on the weekend of 2/3 June 2018. The venue is situated a very close to the railway station in Burton upon Trent (about a 5 minute walk). There is now very little/no parking at the Town Hall so we recommend parking in the station car park (between the Travelodge and the railway lines) or in Derby Street car park (in front of the Travelodge opposite the station). The organisers politely request that the street parking spaces in front of the Town Hall be left free for exhibition staff and exhibitors. All tickets are valid for the whole weekend to allow you enough time to see all the exhibits.